THE GLUTS are around the corner and I’m getting ready, busy amassing my arsenal of blog recipes to deal with The Courgette Glut. You notice the capitalisation – well that’s how it’s said – with appropriate emphasis. 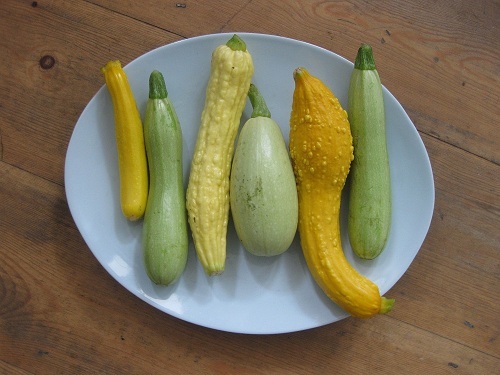 Every year I plant 2 or 3 or maybe if I’m rash 4 courgette plants, you see I like variety in life and I like it in Courgettes – from pale green buttery tasting Cavili to Bright Yellows of Jemmer or the Knobbly Kneed skin of Crookneck Squash best picked and eaten the same day. Courgettes don’t have to be watery, bitter, dark green or huge. They can come in many shapes and sizes, with gentle flavours and textures to match. As the first flutter of courgettes are picked I tried a recipe I’ve had in mind for AGES, The Kale Chronicle’s Courgette and Feta Pancakes. The instant I read the ingredients they reminded me of Greek summer holidays, sitting at a beach taverna, sipping on a cool beer watching the sun go down and starting the evening meal with courgette or chickpea fritters. Sharyn’s version is much lighter and fluffier than those I’ve had on Greek Islands, with the egg whites separated and beaten until white and fluffy which are added at the end to the mix of egg yolks, feta, herbs and flour. The herbs are a must – try them with mint or dill or maybe some Oregano for that hint of a Greek summer. Simply sauté the pancakes in oil and butter and serve with a green salad or perhaps the first of this years red tomatoes to ripen. For a beautiful painted picture and the recipe pop over to Sharyn’s blog. So when I’m short of ideas and big on courgettes I’ll turn to my list of courgette recipes. Many use ordinary courgettes, but you can use summer squash at will, some have been adapted from winter recipes that were originally made with pumpkins, but as long as you give the courgettes and squash some time or salt to drain the liquid from them you’ll be fine. Happy Summer Cooking and Eating. And if all else fails I recommend knock-down-ginger, a game of leaving a bag of courgettes and then knocking on your neighbours door and running. Fast ! 8. Franco Italian Chard and Spinach – just add courgettes into the creamy mêlée and voila – what’s not to love about a gratin ! And I haven’t even touched on simply frying a sliced courgette and adding it to an omlette (or Frittata if your prefer), chopped raw alongside tomatoes and fresh coriander and a squeeze of lime for a Salsa, or sauté ribbons of courgettes and pasta, then there is baking breakfast muffins (which is next of THE LIST) or added as pizza toppings, hidden in rissoles or mixed into a potato salad, let alone in risotto or Stuffed Courgettes. You see there is a myriad of choice when dealing with a Courgette and Summer Squash Glut. And I nearly forgot to mention grated raw in Fresh Vietnamese Style Spring Rolls which takes the tally up to 16. I have a feeling this list could run and run! oh and they say courgettes are boring. HAH. Saving this page as mine are just starting to come in and it’s going to be a bumper crop! I wrote this page so I could save it, so that when I’m looking for ideas I can open it up, so that’s just fab that you’re saving it too Joss ! Great list, Claire! My yellow summer squash succumbed to the bugs early this year, but the zucchini are still coming, and could br subbed into any of these! Last night’s dinner was a galette with an olive oil crust, seasoned riccotta cheese, and zucchini. Eveyone had seconds…and I forgot to get a picture. Guesss we’ll be doing it again soon! When I was a student I lived near a VERY cheap vegetable shop, but the trouble was they priced their stuff by 10’s, so when I wanted a courgette I had to buy ten… Well, the mother of all invention etc., I definitely found out how to use courgettes in just about anything! My favourite remains frying drained slices of courgette in olive oil with a sprinkling of dried raisins and then adding a good dash of lemon juice two minutes before serving. My recipe list is growing – I love lemon on veggies that have been cooked and serving them at room temperature. What a lovely, long list to handle the GLUT! 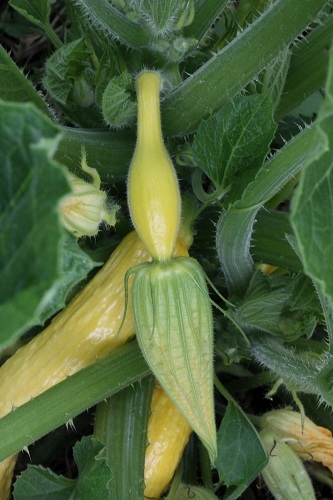 Of courgettes, which is such an elegant word all alone, I think, and brings up thoughts of the delicate green and bright yellow squashes (rather than the gigantic zucchini that got missed first picking). Thank you for a good round of recipe ideas! My pleasure Cindy, and thank you ! I know exactly what you mean about missing courgettes on the plants, miss one and suddenly you are dealing with Marrow type monsters !! I definitely wan to try some of these. Thank you so much for putting the recipes together nicely! Ooops, meant to say want, not wan. Sorry about that. You are the “go to” garden blogger when you need a courgette recipe. Thank you for putting your list together. What a timely post! I have taken to threatening my kids who keep eating the chocolate chips for my “go to” chocolate chip zucchini muffins. So I guess I need a few new ideas;-). The bread will be high on my list! 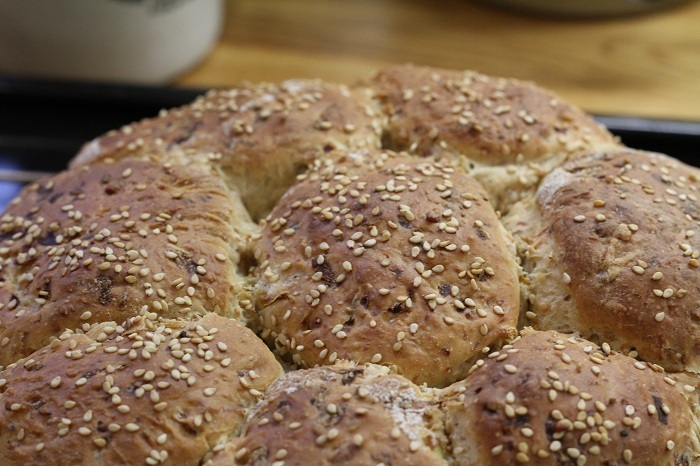 Hi Inger, I think the bread is delicious, in fact I need to make some soon as we haven’t eaten it since last summer! I know friends of mine with kids who have become very skilled at “hiding and disguising” certain veggies 🙂 Good luck and hope you like it ! 1 lemon, zested and juiced. In large saucepan, heat olive oil and butter. Add Garlic, onion and courgettes and sauté for 10 mins on med head, without browning. Add stock and season. Bring to the boil. Turn down and simmer for 10 mins. Remove from heat and, using a hand-held blender, blitz until smooth. Add the lemon zest and juice, and stir through. friend gave this one to me and it is so simple – and delicious. I also ‘hide’ courgette in other things. It works well grated stirred into various dishes… including quiche, or pasta sauces. What a great list, Claire! I want to try the Moroccan salad next. 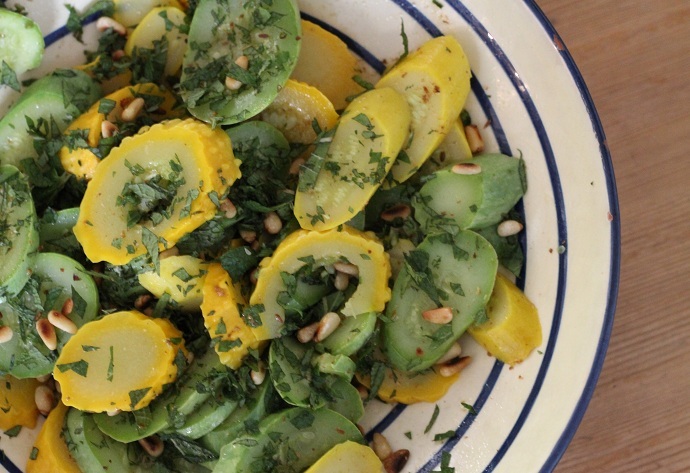 You can’t have too many recipes for courgettes in the summer. Thanks for the mention. Hope you like it Sharyn, I love those kind of flavours, and I remember the mint really added to the dish. The pancakes were superb, I used 3 small courgettes and re-jigge dthe recipe. Converted to light and fluffy soufle type pancakes. Thank you !! Forgot to say, there’s also picking and cooking the squash blossoms to limit squash production! I love the pale green courgettes and spilt in half length wise baked with olive oil, I can’t think of a more tasty way to eat them, just divine! I first tasted them like this in a small Palestinian village about 45 minutes from Ramallah and absolutely will never forget that first time I tasted it and how simple it seemed and yet so much tastier than any courgette I had ever had, I think my mother only ever boiled them, so I never really even tried experimenting with them further, now they are a firm favourite and so full of flavour when baked like this. I think the pale green ones are my favourite too, almost creamy inside, and I’m a late comer to the party as I only discovered them a couple of years ago, but I’m totally converted ! Thanks for the recipes! I have bookmarked the page for future use. Fab! I hope you get to try some, I think my favourites are the salads, but for a quick weekday meal nothing beats a pasta dish ! Some great courgette ideas. Canadians call them zuchinnis. that would be a start 🙂 To b ehonest by the end of the summer we certainly have had our fill !! What an amazing array of recipe choices! If you want to drop a bag off at my house, I will gladly accept them. I have no such glut and would gladly make a batch of “Zucchini Pancakes”. I usually sprinkle feta on top of my pancakes and like the flavor paired with oregano. But Kate’s recipe with fresh corn and light and foamy eggs with feta tucked inside is very appealing. Thank you Deb, Oh how I’d love to drop a bag off at your house, or you could come an dpick your own !! I’m sure you would make a totally delicious meal. And the pancake recipe was a real treat, and now I@ve tried it once I know I will be making them again and playing around with the herbs and flavours, I can see a Spring Onion choppe dup in them, or chives, or…….. And as you say they were light and soufle like, not at all filling, but totally tasty! Hi Claire .. wow .. such an assortment of squash you’ve grown! I’ve only planted 2 types, waiting for them to mature. Your recipes look fantastic .. they’ve given me some ideas to try .. other than my usual baking them in the oven or putting them in soups. Next year I’ll try more!! What are you growing? One year I tried the round ones, but I found them a bit tasteless and watery but that’s probably because I didn’t cook them properly in the first place !! One is a snowy white (called ghost), and then acorn and one other type (I’ll see if I still have the label)… actually, till I started following your blog, I hadn’t realized there was such a variety of squashes available! I usually add lots of butter to the cooked (in the oven) types. I’ll start being more adventurous, following your recipes!! Lots of butter in cooking always gets my vote !! Can’t wait for summer, and getting stuck into courgettes again after reading this. My mouth is watering…. It’s probably heresy, but I put them into ratatouille instead of aubergines, since I can’t eat aubergines…Just looking at the lovely photos makes me long for summer,..
Who cares whether it is heresey if it’s tasty and it works for you !! Wow, Claire! When you decide to highlight a vegetable, you don’t fool around. This is one great collection, one that’s going to be referenced time and time again. Thanks for putting it together for us. 🙂 It was a bit nutty to put it togethe John, but now I have my own list for easy reference, and I can see from comments and suggestions I need to add to it ! Some wonderful ideas for squash! I always make casseroles and just ventured into galettes, but I, too, was intrigued by Sharyn’s pancake recipe. Great post! Thank you Tandy, and thanks for the heads up about not using WP, best wishes with the new site ! I struggle to do links when I use my so-called smart phone 🙂 Th elasagne sounds delicious, and you have reminded me that I haven’t mad eone in ages, I’m off to search for the recipe , thank you ! a classic post claire, i will be back in summer! 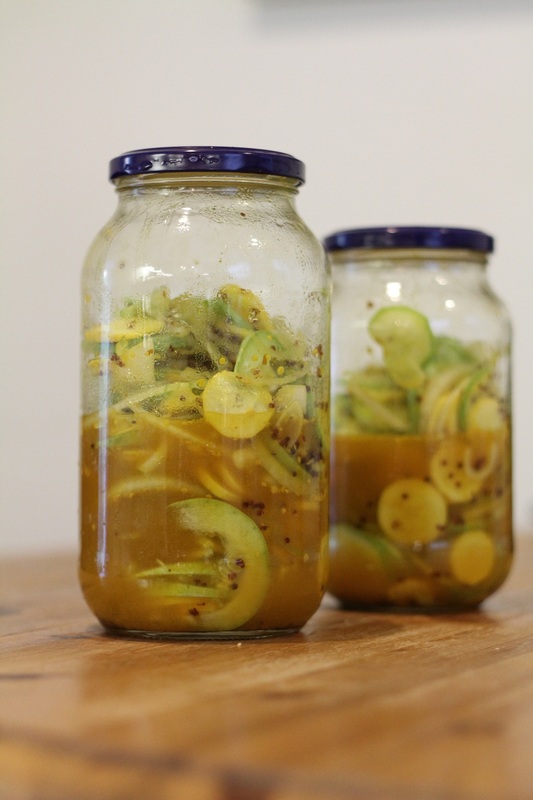 I love the idea of making easy pickles using “the glut” of squash we all seem to have right now. Thanks for all these other ideas as well. Ooooh! Where I live we call this a courgette bonanza! Thank you so much for this resource. I tend to favor those with curry or thai spices. Thank you debra, I was beginning to wonder if they would ever produce, it was such a cold start to ur growing season that they really seemed to sulk and take ages to get going. I think you would enjoy the bread, perfect fo rmopping up a tomato sauce 🙂 and thanks again for the encouragement ! Good ideas all! I just bought some zucchini at the farm stand and am going to try making baked zucchini chips. If they are good, I will share the recipe. Looking forward to seeing the recipe, as that sounds like a great idea !! Aha…looks like you hit a subject we all love! What do I do with all these zucchinis???!!! I’ve posted a link on Face Book. My friends already know about the bag-it-and-run trick so I’m hoping they’ll try some new recipes. Many thanks, these look great. And thanks for posting the link, happy to share! I bookmarked it and I know I will be back to try recipes from it again and again! Now I have so many choices to try! YUM! Fantastic, I hope you do get to try some of the recipes! 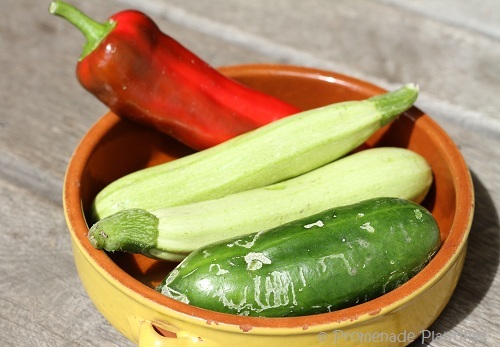 Do you have a recipe for a courgette/summer squash dip? Thank you Claire, I will keep you posted of the ones I try. Fabulous, I’m off for a look now and will as I want to make one for Saturday evening as friends are coming round which means I can shift some of my surplous !! Hi Claire, I will have to check out this post next summer when zucchinis are plentiful. So kind of you Shimon, thank you ! That’s an impressive round-up!! I’ve got one more for you from Sweet Pea’s kitchen. Enough ideas here to keep my taste buds excited for quite a while. I may have to buy at the farmers market as my plants have nothing but blossoms at the moment. Your zucchini are beautiful! I love all of the different varieties! I love the range and variety here! And all so tasty sounding! !